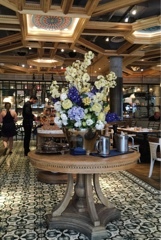 Despite this being a return visit, I still get entranced with Cluny Bistro’s dining room. It’s charming, elegant, intricate and beautiful … so French that Carrie Bradshaw would certainly approve. If only the restaurant were opened earlier, what a perfect place it would have been to host my bridal shower. Brides of today, take note. At first, I was a little worried if Cluny was a serious brunch establishment - our waitress was unsure whether they carried English Breakfast. 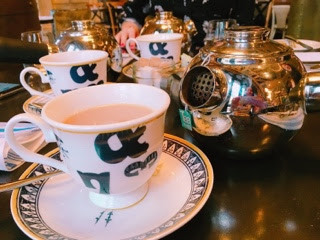 Yet, one sip of the flavourful Tea Squared brew ($4) eased away any fears and I was ready for food. Their weekend brunch menu includes French favourites (onion soup), traditional breakfast offerings (omelets), and then there’s classics with a twist. 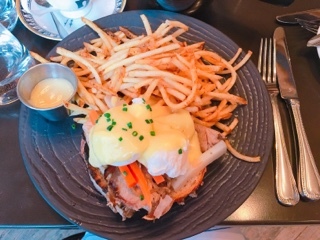 The pork banh mi benedict ($19.75) seemed out of place at a bistro, yet the promise of roasted porchetta and ultra-thin frites were too hard to resist. Something about the combination of roasted pork, crispy crackling, pickled vegetables and well toasted sourdough bread … the aroma is hard to describe and incredible. 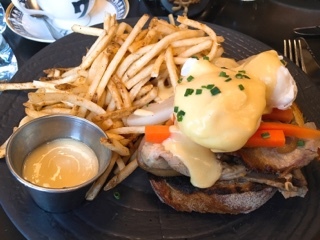 The runny poached eggs went nicely with the ample chunks of porchetta, although I found the pickled vegetables were best eaten on their own. The thick slice of grilled sourdough soaked in all the delicious juices, but required a utensil sharper than a bread knife to cut through. Cluny’s adjoining boulangerie is fantastic and after having a taste of the freshly baked breads during brunch, we had to stop into the bakery for things to go. Get the roasted garlic focaccia ($3.50), it’s not overly oily but still has a lovely sponginess; the liberal sprinkling of salt and sweet cloves of garlic topping the focaccia meant I didn’t even need butter. Brunch and groceries all procured in one spot, what an efficient start the day.